FOR A PEACEFUL MEDITERRANEAN WITHOUT FEAR ! 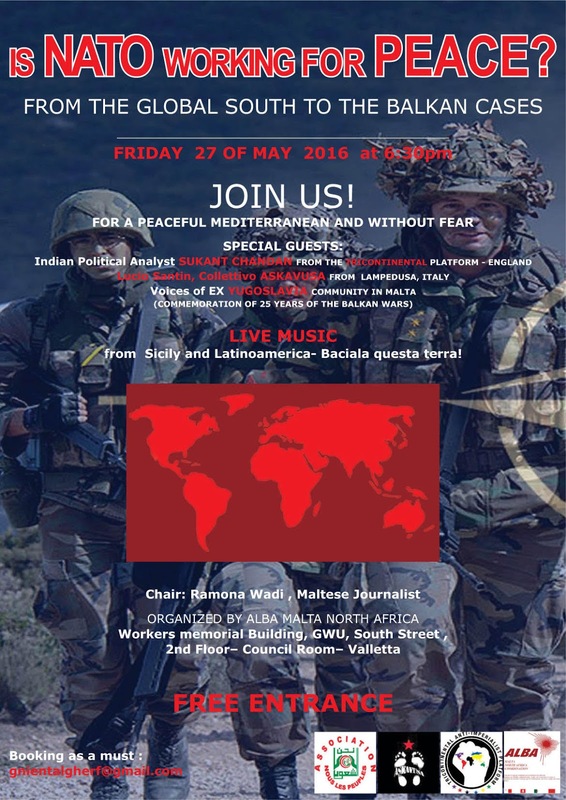 Alba Malta North Africa Coordination , the Anti imperialist Tricontinental Platform- England and Collettivo Askavusa from Lampedusa have the pleasure to invite you to this Public event . AND LIVE MUSIC : BACIALA QUESTA TERRA ! with Cesar, Fernando, Erno, Nolasco! This last event will be dedicated to all the exiles people, refugees of NATO, forced to leave their homeland And to commemorate the 25th years of the Balkan wars.